Scoundrels by Gary Phillips, editor, a Mysterious Review. 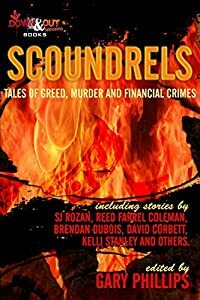 Review: In the preface to the short story collection Scoundrels, Scott Phillips asks, "What other group of human beings inspire such a level of hatred and disgust in us as the white collar crook, [who] inspire nearly as much opprobrium from the rest of us as a serial killer, a genocidal dictator or a child molester?" That is the premise that ties these stories together, but fortunately what could have been a one-note collection is, in fact, a surprisingly diverse set of stories that all feature some sort of white collar crime, but not necessarily a white collar criminal. Indeed, the book is subtitled, "Tales of greed, murder and financial crimes." The very first story, "What the Creature Hath Built" by David Corbett, has probably the best single line that sums up the stories contained within: "The thing about thievery … is that once you make a few moves and don't get caught, you get a bit more bold, which is to say clever, otherwise known as reckless." In that statement, "thievery" can be substituted with "murder", "blackmail", or any of a dozen other illegal activities. It's a great line, taken for granted in many crime stories, but it bears stating once in a while. There are some unusual stories here. "We Shall Overcome" by Tyler Dilts, for example, has as much text devoted to footnotes as it does the story itself. It doesn't make for fast reading, constantly moving back and forth between the narrative and the often wry clarifying and explanatory notes, but it must be said it is incredibly entertaining reading. Reed Farrel Coleman's "The Prophet" is set during the Great Depression, making the not so subtle point that financial misdeeds are not a modern invention. There are also a handful of predictable stories, given the theme of the collection, ones in which those taken from take back from the taker. Still, these stories are generally well plotted and have an unexpected twist or two in store for the reader. An interesting collection, to be sure. And one that is worth — pardon the pun — investing in. Acknowledgment: Down & Out Books provided a copy of Scoundrels for this review.